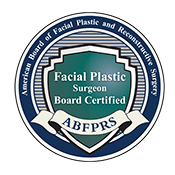 There are a variety of reasons you might not be ready for facial plastic surgery. While it remains the only long-term fix for an aging face, it just may not be the right option for you now. Maybe you feel like you’re too young and want to focus on prevention so you postpone surgery for a few years. Maybe you’re wondering if improving the surface quality of your skin could provide the temporary “lift” you’re looking for. Maybe you currently have an extremely busy schedule that won’t allow for proper recovery from facial plastic surgery. Maybe you’re looking for a way to test the waters in facial skin enhancements for your specific problem areas before stepping up to a mini facelift. 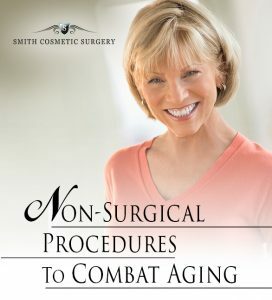 Maybe you’ve listened to the professionals at Smith Cosmetic Surgery and know that nonsurgical procedures are a great way to maintain your new look after a facelift. However you come to consider nonsurgical procedures, know that there are many to choose from and you may need a little guidance on what will work best for your unique genetic history, skin type, age and lifestyle to achieve the results you desire. Dr. Brent J. Smith and his exceptional staff are available to walk all patients considering both surgical and nonsurgical procedures through the suite of different options available today. 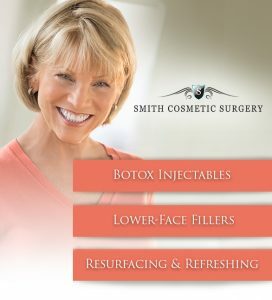 Dr. Smith, who has focused exclusively on facial plastic surgery for more than 25 years, uses only the best and most proven techniques, laser technology and skincare lines. Which nonsurgical procedure is right for me? So you can make the most informed choice possible, it’s important you understand how Smith Cosmetic Surgery thinks about its nonsurgical procedures. Because there are so many different fillers, resurfacing lasers and skincare products on the market, we think it’s easiest to first focus on which area of the face each is designed to treat. The popular and highly effective BOTOX® Cosmetic injectable is made to treat the upper third of the face—forehead wrinkles, lines between the brows and crow’s feet—by relaxing muscles overtaxed by constant expression. BOTOX is injected under the skin at the site of specific problem areas and delivers a lasting, age-defying lift that patients love. It works by gently calming the tiny muscles around the forehead, eyebrows and corners of the eyes so they can’t wrinkle as easily from the repetitive expressions we make all day and night. When we’re busy with work or life’s tasks, often we have no idea how much we are squinting, frowning or focusing. BOTOX helps reduce these movements, in effect preventing new wrinkles from forming, while still maintaining a very natural look. Denver facial plastic surgeon Dr. Brent J. Smith offers many nonsurgical services to address common signs of facial aging, including dermal fillers and laser skin care. People in their 20s are now coming in for BOTOX treatment as a preventative measure, so they can head off and slow the face’s inevitable signs of aging. It’s no wonder it’s one of the top-requested nonsurgical procedures in the world. The lower two-thirds of the face may require a different type of dermal filler, known as a volumizer, to redefine gaunt cheeks, fill out smoker’s lines or tastefully plump disappearing lips. Leveraging well-respected brands, such as gel-filler Juvederm® and the fast-acting Radiesse® volumizer, we take a conservative approach to the lower portion of the face. Because the cheeks, for example, are so prominent, our talented RN takes time to fill facial features so they look entirely natural—never over-injected. The beauty of fillers for the lower section of the face is they not only start working the day they are applied under the skin, but they keep on working after you leave our office by stimulating the skin to do its own work. The filler procedure actually stimulates the skin to grown new collagen—the critical stuff that supports the structure of our faces. Wherever the injectable is applied, it will send a signal to the body to start making more of its own collagen. How’s that for an added benefit? Of course, outside of specific nonsurgical fillers and volumizers, there are a wide variety of skin enhancements that can deliver a temporary glow of youth or fix pigment issues such as uneven skin tone or sunspots. One of the most effective is Smith Cosmetic Surgery’s fractional CO2 laser, which can be applied to treat almost any issue on the face, neck and even the upper chest or décolleté. These can include softening stubborn wrinkles, reducing the appearance of large pores and equalizing uneven pigmentation. Laser technology has allowed Dr. Smith to offer a completely custom nonsurgical procedure that works on specific problem areas and can go as deep as necessary to produce results. If you’ve already had a mini facelift or laser skin resurfacing and are looking for a way to refresh after or in between surgical procedures, regular skin treatments are a great way to enhance that youthful look and feel. The skin treatments at Smith Cosmetic Surgery range in type, from a laser facial meant to go a little deeper to a gentle exfoliating peel. Our skincare professionals have been doing this for decades and know exactly what will work best for each patient. Microdermabrasion: Considered today’s skin-maintenance must, our “crystal-free” microdermabrasion offers mild resurfacing with low irritation, cleansing the pores for a healthier, more refined look. Laser facial: This facial leverages our custom laser to treat fine lines and wrinkles while stimulating collagen production for maximum effect with minimal down time. Glow skin treatment: Patients report feeling like they “glow” after this 90-minute treatment, which includes microdermabrasion, a light chemical peel, concentrated hydroxy acid masque and LED-light session. DermaPeel: Exfoliate to the extreme with this hour-long combination of microdermabrasion, a light chemical peel and extractions, ending with a soothing, hydrating masque. Acne facial: Target those troublesome oil-trapping pores and promote cell turnover with a safe acne peel, which uses alpha and beta hydroxyl acid to reduce excess oil and diminish the appearance of large pores. We also recommend physician-directed skincare products and healthy daily routines to make sure the results of any of our nonsurgical procedures are amplified daily on your fresh face. Now that you have a clean slate, the key is keeping skin clean, well hydrated and protected from the elements. You don’t need to buy—or apply—layers of over-the-counter products if you focus on a high-quality moisturizer and a high-potency anti-aging serum with retinol, the only ingredient proven truly effective on maturing skin. These choices will actually save you money in the long run. 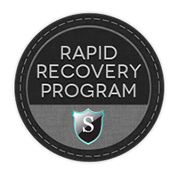 Smith Cosmetic Surgery is happy to walk all new patients through smart skincare routines following any nonsurgical procedure at our office in Denver. Have more questions about which nonsurgical procedure is right for you? Please contact us to schedule an appointment to learn what will work for you, your individual skin and your lifestyle.